In an evolving story based on mankind’s instinctual need to explore, protect and survive, you’ll delve deeper into Europa’s ice crusted-core and discover that the l ines between man and machine begin to blur. Armed with the Energy Manipulation Turn (EMT), solve puzzles to open the way forward as you learn the true cost of human morality. • Harness the ability to transfer power between machines using your ‘Energy Manipulation Tool’ providing a unique twist on gameplay mechanics and puzzle logic. 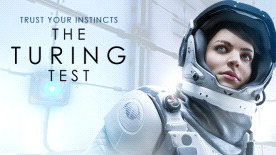 • Learn the significance of player control as you switch between multiple perspectives to solve The Turing Test’s most challenging puzzles. • Discover a story with multiple layers of depth and conspiracy; challenging concepts of human morality and giving freedom to players to form theories about the fate of ISA's crew members.